As college students, it’s hard to imagine eating any kind of pizza other than frozen. But bland cardboard and spaghetti sauce gets old after a while. If you’ve been in Savannah for any length of time and have not ventured out to Screamin’ Mimi’s for an authentic, reasonably priced meal, then you are really missing out. Located in the historic district of downtown Savannah on the corner of Oglethorpe Ave. and Price Street. Screamin’ Mimi’s is a bit off the beaten path. Because The Crawford Square Plaza is outside of the hustle and bustle of downtown, it makes customers feel as if they have discovered a hidden gem. As quaint and personal as it may seem, the family owned and operated business has not gone unnoticed in years past. With four and a half stars on Urbanspoon and four stars on Yelp and Tripadvisor, it is apparent that people rarely leave this pizzeria unsatisfied. Mimi’s has also won multiple awards, including Best Pizza of 2010 and the 2014 certificate of excellence from Tripadvisor. 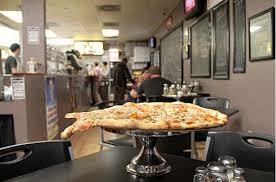 Mimi’s Jersey style pizza, pasta and subs are made utilizing Mimi’s own recipes and Lou Jr’s dough making experience. The dough is made fresh several times a day, hand tossed and cooked to perfection in brick ovens. The staff at Mimi’s produce their products with the freshest ingredients from local produce delivered daily. Some of the biggest hits on the menu include: meatballs, greek salad, baked ziti, philly-cheesesteak, and the white tomato basil pizza. They also offer superb lunch specials Monday through Friday from 11 a.m.- 4 p.m. including two huge slices of cheese pizza and a drink for $5.61 or any sub, chips and drink for $9.35. Not only is the food exceptional, but the people at Mimi’s go above and beyond to treat their customers like family. Frequently customers walk in and are greeted by first name from the warm and welcoming staff. Nice people combined with hip music makes for a great place to chill and get a bite to eat. There is also plenty of outdoor seating for those pleasant Savannah afternoons and evenings. Friends, family, and children enjoy drawing on the chalk boards surrounding the tables inside, making the atmosphere fun and casual. Pet lovers are also welcomed and drinking water for dogs is provided. If a frozen pizza ever seems like a more convenient choice, then just remember that Screamin’ Mimi’s offers free parking, which is rare in downtown Savannah. They also provide the options of online ordering, and delivery. Open from 11 a.m. to 11 p.m., stop in for delicious food and a good time.